This entry was posted on November 21, 2016 by Kailey. The magic toolbar. That weird touchy thingy. Revolutionary tech. All words used to describe the Touch Bar for MacBook Pro released by Apple in October. While gorgeous in design many were left wondering what functionality it would serve. The MacBook Touch Bar offers great opportunities for anyone working in the creative field. It also, offers plenty of great features for the casual user. We’ve scoured our favorite sources and found some of the best insider knowledge to help you in getting the most out of Apple’s latest tech. The Touch Bar for MacBook Pro was long suspected by many tech blogs and came as not much of a surprise to the ardent techie. But with a simple design and interface change, the Touch Bar is changing the way we use laptops. It replaces the function bar at the top of your keyboard. Yes, that thing you’ve use to turn down your volume while watching Netflix. While all those elementary tools will still be available, the Touch Bar offers a faster and ever-changing way to use it. Instead of only using it every once in a blue moon, Apple intends for the Touch Bar to become an interactive tool used daily. It, like many of Apple’s products, is generally user-friendly. Siri, volume, and other important general functions will always be available on the right side. The rest of the Touch Bar will instantly change, depending on the application. From messages to photo editing, it offers shortcuts, easier editing and creates a more balanced workflow. 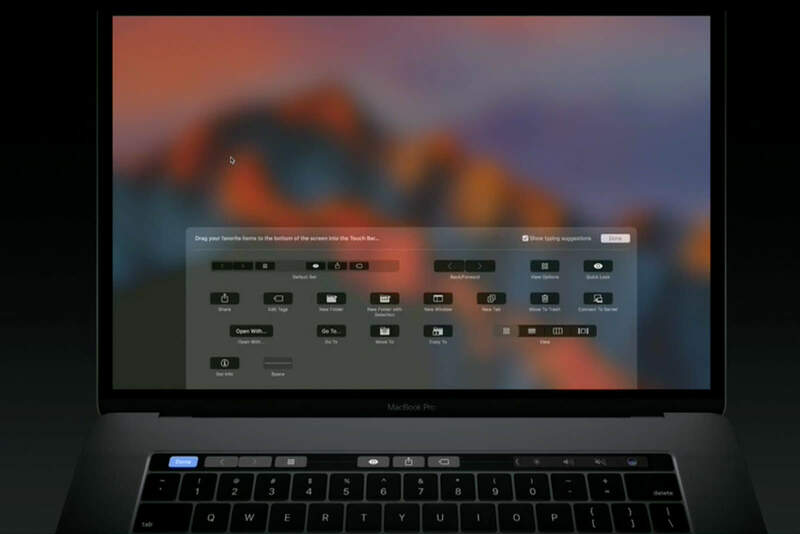 Apple is so dedicated to making sure that the Touch Bar functions to increase productivity and not act as a distraction that they’ve even made strict rules about its use by third party applications. A look into customizing your Touch Bar. Once you’ve gotten comfortable with the basic fundamentals of the Touch Bar, customizing it to your preferences will make it work more in your favor. Editing and adding applications to your Touch Bar is as easy as dragging and dropping. Laptop Magazine has created a great tutorial for how to easily customize your Touch Bar that you can find here. While the hows and whats of the Touch Bar have been covered, with it being open to third party development there’s plenty more to explore. Apple has released OS updates to make their own applications to be compatible with the Touch Bar and you can expect third party applications to begin popping up even more frequently now. Safari browsing is made simple with the Touch Bar as tabs can be easily switched between with just a tap. Open a new tab and your bookmarks will be available to pick from. Want to search quickly? The search function appears on your Touch Bar instantly so you can find that one list of Hogwarts houses as assigned to Marvel characters with ease. Is your spelling comparable to a 5th grader? Or does the word ‘necessary’ just trip you up every single time? With Touch Bar, while typing up an email or message, look down. The Touch Bar will prompt words and spellings quickly for you. Tap and it will insert itself in automatically. While most writers won’t need to use this constantly, it does offer a little nudge of help when it comes to those words that are constantly tripping you up. If you’re trying to get hip with Emojis, Touch Bar will make your life easier. If you can find the appropriate place to use the , you’ll be good to go. Just please, use the appropriately. Edit: Check out Pixelmator, an app recommended to us by one of our readers. Thanks Norm for the tip! 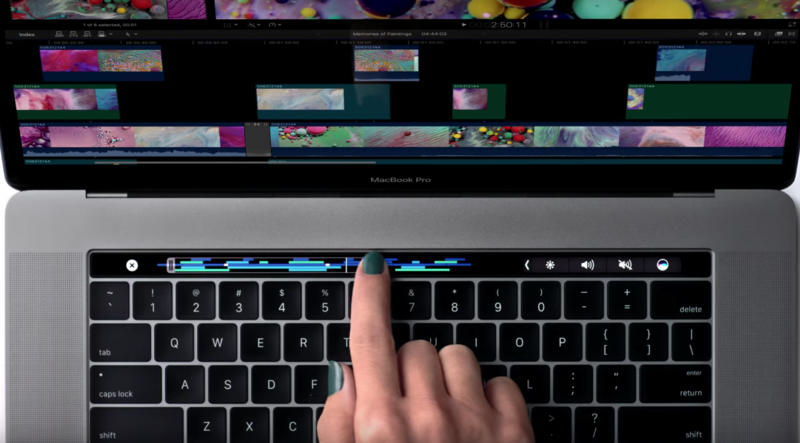 If you work in any industry with photo editing the MacBook Touch Bar has been designed for your needs. With the likes of Photoshop, Drop Color Picker, and Sketch, editing will become a breeze. If your Instagram is filled with pictures of your dog, baby or latte, Touch Bar is just as useful. In Photos you can easily switch between filters, edit the lighting or crop with a few swipes on your Touch Bar. It is significantly less difficult to edit than on a trackpad and with an iPhone 7 Plus, you’ll be creating your own art within minutes. Shopping for leggings in safety. The MacBook Touch Bar introduced Touch ID for the laptop world, a great feature for additional security. Let’s be honest, when your password is ‘123ABC’, your fingerprint far outpaces it in terms of security. Plus, you can just as easily switch between users if you share your computer. Our favorite part? Apple Pay. Considered to be an incredibly secure way to pay for just about anything on the internet, it easily allows you to simply press your finger in the TouchID space and just like that your favorite Amazon order is on its way. If you’d like to simplify and secure your life, 1 Password is a great option to do just that! The third party application works by unifying all your passwords, and now can be linked through your Touch ID. While the application may cost a bit more, it is one of the most secure ways to keep all your passwords and sensitive information secure without having to hide it under the mattress. While the MacBook Touch Bar is an innovative piece of tech from Apple, it’s still a work in progress. Third party applications are adapting as is Apple. The best way to understand the ins and outs of it is to simply start using it. With these handy tips and tricks, the basics of use should come secondhand. Plus, practice makes perfect. The best part about the Touch Bar is it’s purposeful design to improve workflow. You won’t find any distracting ads or annoying colors popping up on it. This entry was posted in Macbook Pro and tagged MacBook Pro 2016, Touch Bar, apple news, MacBook Pro, Pad and Quill, Apple on November 21, 2016 by Kailey. I believe that's Pixelmator in the photo editing image, a really great app! You should give them a mention.